I am JB Michaels, award-winning and USA Today Bestselling Author of two series: Bud Hutchins Thrillers and the Tannenbaum Tailors. A Capitol Abduction: Fairies in Flight is an action and adventure thriller for young adults and preteens written by J.B. Michaels. After the tumultuous events that marred this last Christmas season, Jane wanted nothing more than to rest and restore her flagging energy -- and give her wings the time they needed to recover from the damage incurred by traveling to the South Pole. It seemed that she had just fallen asleep when she was woken by her phone’s vibrations against the floor where it had fallen. The tenor of Admiral Pixie’s voice clearly signaled the urgency of his call, and she quickly realized that the fourteen hours she had actually slept were a gift. Still, however, her wings ached, and the headache she’d been trying to ignore was nearly a migraine. The Fae Fairy was used to pushing aside her own bodily discomfort as part of her role in inspiring and leading others, and so she quickly dressed and flew over to the hangar where Admiral Pixie’s office was located. The news he had to impart was stunningly grave: three of the Tannenbaum Tailor teams had lost their Fairy Flyers while the teams were tending their trees. Those Fairy Flyers had simply vanished without a trace. 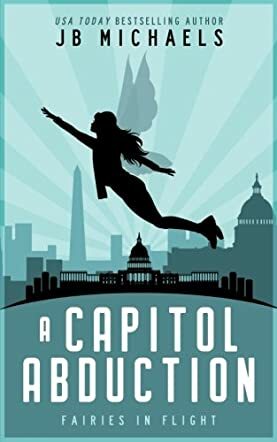 J.B. Michaels’ action and adventure thriller for young adults and preteens, A Capitol Abduction: Fairies in Flight, is a fast-paced and exciting tale that follows Jane and her sister Kath as they battle sinister and unseen forces -- and each other. While the author gives enough background information to allow this book to be read on its own, I would strongly recommend that readers begin with the first volume in the series, The Tannenbaum Tailors and the Secret Snowball, to more fully appreciate this imaginative and entertaining continuing saga. Michaels’ stories transcend the basic presumption of belief in Christmas, the North Pole and Santa, and build instead an epic fantasy structure that works on so many levels. His characters are credible and complex, and his plot is tidy and clever. A Capitol Abduction: Fairies in Flight is most highly recommended. A Capitol Abduction: Fairies in Flight by JB Michaels is an amazing multi genre adventure that begins with the main character, Jane; one of the most renowned "fae" flyers with natural leadership ability. Upon returning from the South Pole and exhausted, she is given the assignment to find some missing Tailor flyers that disappeared the day before Christmas Eve. After the preliminary investigations, Jane finds out that, as she put it, "There is a mole at the pole," meaning the North Pole. From there she recruits the help of her most loyal and capable friends. The investigation leads to Washington D.C., and the need to bring back the captives for fear of the faery world being exposed. Mr. Michaels does an absolutely amazing job of integrating the basic laws of fairies created by author JM Barrie. The author's unique fairies act more human than his counterparts. They go to night clubs, and even get into bar fights. It was not hard to fall in love with these well developed characters as this page turning story progressed. JB Michaels integrates sibling rivalry, traitors trying to get sympathy votes, and a host of other colorful personalities, combined with a flawless writing style that captures all of the thrilling suspense that you would expect from a box office smash. The plot has many unexpected twists and surprises to keep you on the edge of your seat as the reader is invited along to try to figure out who can be trusted and who can't. I was almost sad when the adventure came to an end, because I was entertained on all levels. A Capitol Abduction: Fairies in Flight is the adventure of a lifetime, and I was left wanting more. All can say is bravo! Encore! A Capitol Abduction by J.B. Michaels is a Fairies in Flight novel. Jane has returned home from dealing with the Spiritless Invasion. Her only plan is to sleep. The last thing she expects is to be called in to investigate the disappearance of three fairies in Washington D.C. The case becomes personal when Jane's close friend is the next to disappear. Jane turns to a Tree Elf named Lily and her estranged sister for help, but when the group is attacked by a mysterious phantom they're led to a surprising source. This world comes to life from the first page as J.B. Michaels immerses you in this fairy world set in 1989. The use of jargon is used in this fairy system, making this society vivid and real. The fairies have their own gadgets and way of communicating with magical ecosystems, GiftBox cars, and humorous nods to real items such as 'Cheap Spice.' Since this gritty secret world is set during the 1980s, it incorporates fun references including the fairies needing to rewind a tape and a comment about the humans' lack of advancement in technology. It has a modern vibe with creative fairy gadgets like candy canes to hack into technology with. There's also a delightful reference to J.M. Barrie basing Tinker Bell on a real fairy. The world is fun and creative, a detailed and unique take on fairies mixing fantasy with a mystery. When Jane and her friend are on their way to Washington, they have to deal with being so small by having to fight off birds trying to catch them like prey. It gives a real sense of danger, more than just from humans. Michaels captures what it's like to be so tiny and the dangers simple nature can bring. While investigating the fairy disappearances, Jane and her sister have to find a way to navigate through their estranged relationship which affects how they relate to each other. A Capitol Abduction is a fantasy adventure with mystery and humor, with intriguing twists, betrayal, family, and a surprising turn of events.